Microsoft’s recent “Laptop Hunters” ad campaign is centered on the idea that Macs are more expensive than PCs and that the cost of core business and productivity tools for the Mac add to that expense. While the premium cost of Apple’s hardware will always be part of the Mac vs. PC debate, the truth is that you can get a lot of work done on a Mac without spending a lot for software — or, indeed, anything at all. In this guide, I’ll look at 10 free and donationware tools that you can use to accomplish virtually any common office or personal productivity task. Working with word processing documents, spreadsheets and presentations has long been a primary use of computers. Mac users have a range of paid options for creating and editing such documents, headed by Microsoft Office for Mac http://www.itbusiness.ca/it/client/en/home/News.asp?id=46733″target=”blank (US$149 to $399, depending on the version) and Apple’s iWork ($79), but there are also a number of open-source and free options. The first option, for word processing only, actually comes bundled with Mac OS X. 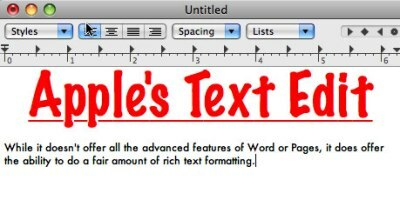 Although TextEdit is generally considered a basic text editor, it does support styled text and multiple fonts. The most recent version of TextEdit, included with OS X Leopard, can open and edit files in rich text format (.rtf), Microsoft’s old and new Word formats (.doc and .docx), and the OpenDocument format (.odt) used by OpenOffice. With Mac OS X’s global spelling- and grammar-checking capabilities, it can serve as a replacement for Word, provided you don’t need to use any particularly advanced features like footnotes or change tracking. NeoOffice, a Mac OS X port of the open-source OpenOffice suite, is available for both Intel and PowerPC Macs. It features word processing, spreadsheet, presentation, drawing, and database tools that are fully interoperable with the various file formats of Microsoft’s Office apps (including the Office 2007 XML formats), with the exception of Access databases. NeoOffice has been available to the general public since 2007 (though earlier beta builds existed as far back as 2003) and was the first fully Mac-specific port of OpenOffice. Its interface varies a bit from Microsoft Office (and can sometimes seem a little less intuitive or polished, though no less functional), but it offers access to a complete range of features, including support for templates, change tracking, styles/formatting, spelling and grammar checking, and notation of documents. Once you get used to the interface, NeoOffice can easily serve as a complete office suite. Last October, OpenOffice.org released its own Mac port of OpenOffice. Not surprisingly, OpenOffice’s interface and functionality for the Mac are identical to NeoOffice in many ways. There are, however, a couple of differences. For instance, the current release of OpenOffice doesn’t support the Office 2007 XML file formats. It also seems to run a bit slower than NeoOffice on most Macs. On the flipside, OpenOffice does offer a slightly more intuitive interface in some areas, such as a more detailed dialog of options for creating new documents with a gallery-style view. Although both OpenOffice and NeoOffice are good solutions and you may want to try both, my personal preference is for NeoOffice, primarily because it offers slightly better performance. Good task management can be important both at work and at home. Whether you’re naturally good at managing things or your desk is a clutter of notes on everything from Post-its to napkins, these tools can help you organize projects and to-do lists. Based on the Getting Things Done philosophy, Bartlomiej Bargiel’s iGTD is a comprehensive task and project-management tool for Mac OS X. With it, you can manage projects and tasks, delegate tasks to others, tag individual tasks according to categories, and review projects and tasks in a variety of ways. The software relies on a built-in task-management calendar but can also sync with iCal, and it is designed to integrate with Apple’s Mail and Address Book for managing contacts associated with projects. iGTD even offers the ability to automatically sync data among multiple Macs via Apple’s MobileMe. iGTD is donationware, which means it’s free for anyone to use, but the developer gladly accepts donations of any amount. If you need a solid project-management tool, iGTD can be a great choice for its mix of features and its donationware status. If you need a more modest task- and information-management tool that you can access anywhere, Evernote may be your best option. This is not a project-management application. Instead, the service lets you create and organize lists of tasks and other information. In fact, you can tailor it to gather and organize whatever type of information you want to remember — it supports text notes and tasks, snapshot images, Web clippings and audio notes. The free service lets you upload up to 40MB of material per month. There’s also a premium version ($5/mo. or $45/yr.) that allows you to upload up to 500MB per month. One of the best features of Evernote, beyond its inherent flexibility for capturing information, is that you can interact with it in a variety of ways. You can use a Web browser from anywhere, but Evernote also offers a desktop application for Mac OS X Leopard (there’s one for Windows XP/Vista too), which gives you a Mac-native experience with more advanced features than the Web interface offers. There are also mobile apps for the iPhone, BlackBerry, Palm Pre and Windows Mobile devices. Although not specifically a Mac tool, Evernote’s capabilities and Mac application make it an excellent option for Mac users. There are a number of personal finance applications available for the Mac at varying price points. However, the following two apps are both available for free and are decent choices for managing your personal finances and tracking how and where you spend money. Buddi is an open-source personal accounting tool developed by Wyatt Olson. It doesn’t sport a particularly fancy interface like Quicken or other commercial tools, and its feature set is pretty light. Buddi supports basic account transactions (for cash, checking, credit cards, loans and so on) as well as overall budgeting and analysis/reports. And that’s about it. While it may be a no-frills tool, it still accomplishes the basics of what you need to manage your money and to develop personal and household budgets. In fact, the back-to-basics approach can be a plus if you’re looking for a simple and easy tool. If you’re looking for a personal finance manager with a little bit more polish than Buddi, check out Martin Davidsson’s open-source Balance. Again, its features are on the basic side, but it supports tracking of a variety of accounts and account types, displays a running tab of your net worth, and allows you to create transactions in any category you choose. It also displays an up-to-the-minute pie chart or line graph of your expenditures by category, making it easy to track where your money’s going. Balance has a more streamlined interface than Buddi, but depending on your personal tastes and how you conceptualize your finances, you might find Buddi’s overall feature set a better choice. In a cross-platform world, it pays to be able to run Windows on your Mac. While you can’t do this completely for free — you’ll have to shell out for a licensed copy of Windows — you don’t have to pay for the Mac software that runs Windows. Apple’s Boot Camp is dual-boot software that’s included with today’s Intel-based Macs. Boot Camp allows users to partition their hard drives into separate Mac and Windows volumes and install Windows XP or Vista. The catch is that you can’t run Mac OS X and Windows simultaneously. Virtualization software, on the other hand, allows Windows to run alongside Mac OS X as a guest OS in a virtual PC. Sun’s open-source VirtualBox offers roughly the same core feature set as commercial virtualization software such as Parallels Desktop and VMWare Fusion. Some add-on features aren’t matched, but VirtualBox is a solid program that comes at no cost. Installation is also generally simple and straightforward. This last entry may not fit into some people’s idea of office or productivity tools, but I’m including it because antivirus software is a must on any computer today, Mac or Windows. And let’s face it, having a virus or malware on your machine can certainly keep you from getting work done. While there are a number of full-featured commercial antivirus solutions available to Mac users, there is also the free ClamXav. Based on the open-source Unix ClamAV application, this tool offers solid virus-detection capabilities. It does have some limitations — it doesn’t offer full disk scanning of a Mac’s startup disk, nor does it offer the ease of automatic functionality offered by some commercial tools. But for a free solution, it is solid and reliable. The tools in this guide offer you some of the best options for getting work done and managing your personal and professional life easily and effectively. However, this is by no means an exhaustive list of the free and low-cost options out there to accomplish any manner of tasks on the Mac.